There is something about a rodeo that changes the visible culture, or, at least, what seems to be the normal dress code for many folks. Baseball caps are traded for cowboy hats, beige slacks and cargo pants are changed to blue jeans, and footwear for a day out with the family changes from running shoes or toeless sandals to cowboy boots. 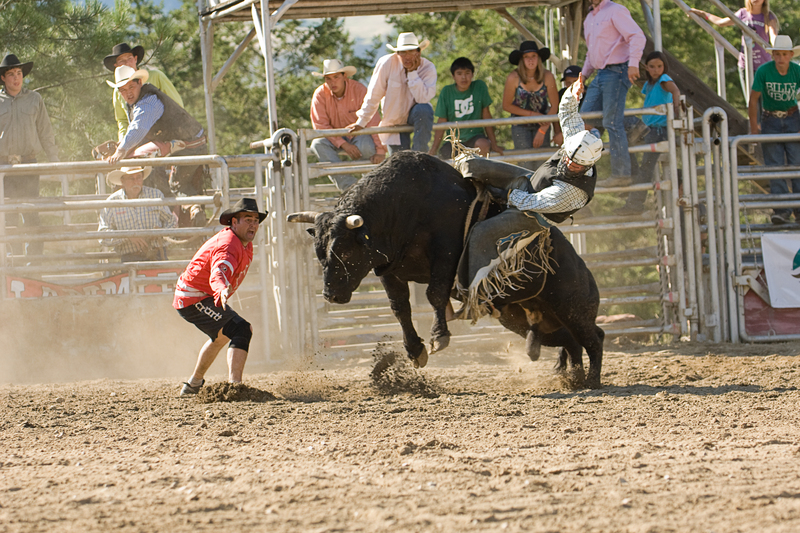 It could be that a sporting event like a rodeo is more a celebration of a lifestyle than others that are attended by fans donning a team jersey and cheering for their favourite team. I was late and the saddle bronc riding had started, but that gave me the opportunity to watch the photographers and I easily figured out who were the first-timers, the dedicated amateurs, and the experienced rodeo photographers. Anytime I am faced with a new photographic adventure I look to those with experience, and don’t mind asking questions if given the chance. I also realized there was time between riders so I would have time to check my metering and get myself in the best position for the action. It was hot under the midday sun and a bright blue sky with riders starting from a location that was under deep shade, which was fine for them, but I knew that no camera sensor could handle that much contrast; and I knew I would have to make exposures before the participants reached the sunny area, wait, change settings, then start making exposures again when they were in the bright light. I missed the first, and then nailed the rest when I figured out the timing. I quickly learned how important it was to listen to the announcer, not only because he was expressive and fun to listen to, but also because he gave all sorts of important information a photographer could use about the horse and rider. I am experienced at photographing sporting events, so other than the time it took me to know where to stand for each event, I was ready. My camera was mounted with a 70-210mm lens and I selected shutter priority mode, with 1/500th second shutter speed. The bright day let me get away with ISO200. I also selected the continuous shooting mode so I could get bursts of up to eight frames a second if I wanted. I photographed from several locations then moved to one end of the arena where five photographers were working. There was a husband and wife team who said they were “just enthusiasts” that liked to photograph rodeos in their spare time. One fellow said photographing rodeos was a hobby, and he had just returned from photographing one in Arizona. I also met a vacationing photographer from France, and while travelling through Kamloops she had heard about the Pritchard rodeo and decided to spend an extra day to photograph the rodeo before continuing south to the Okanagan. We talked about photography and her trip, and, of course, I reminded her about the wonderful BC wineries she would be soon be driving by. All those people were great to meet and added another dimension to an already great day of photography. Along with them, I met Bernie Hudyma (http://www.berniehudyma.com), an experienced and well-known photographer whose images regularly appear in magazines. In my opinion it doesn’t get much better than that when one is trying to learn about photographing a subject. He gave me tips on where to shoot, and once reminded me I had to take care as a massive bull charged the fence where I was and I quickly pulled back. (Just how heavy are those animals?) Nevertheless, it was a fun day of shooting and I ended up with lots of great photographs. 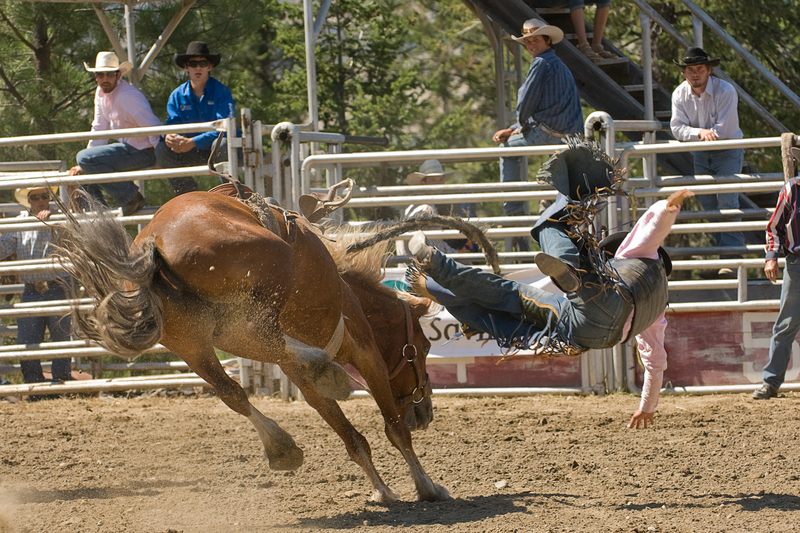 For those photographers that want to try something new and exciting, I recommend finding a local rodeo. Photographing those explosive moments, as Madsen puts it, “the interaction between man and animal… makes the technical and creative aspects of rodeo photography so exciting and rewarding,” which corresponds to how I found the experience – very exhilarating and satisfying. 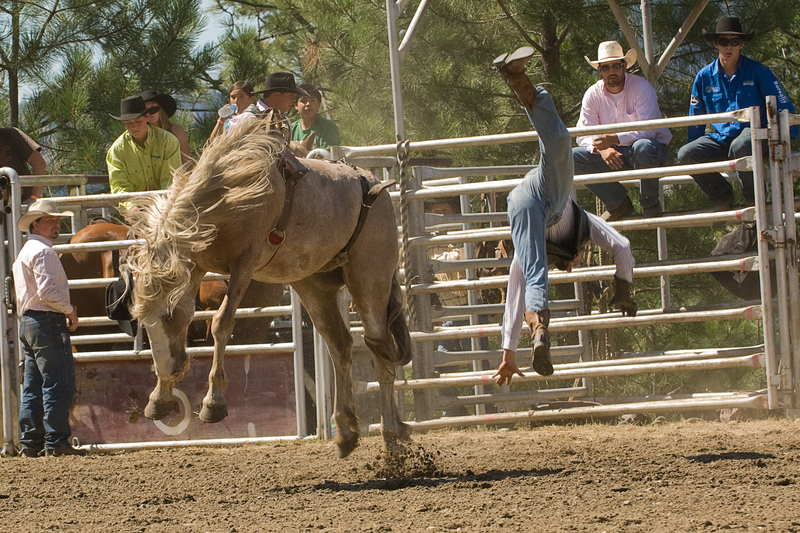 This entry was posted in Photography and tagged camera, photography, pritchard, rodeo, rodeo culture. Bookmark the permalink.